Home / Blog / Flues for a Manifold System. SGL in Muir of Ord, in Scotland, make fibres and materials for composites. They develop tailored and sustainable solutions for the mega trends mobility and energy, covering the entire value chain from raw material to finished component. The products are mainly used in the automotive, wind energy, and aerospace industries. Carbon itself has unique properties in that it enables the manufacture of solar cells, which subsequently increases wind turbine performance and reduces the weight in aeroplanes, cars. etc. This leads to less CO₂emission. 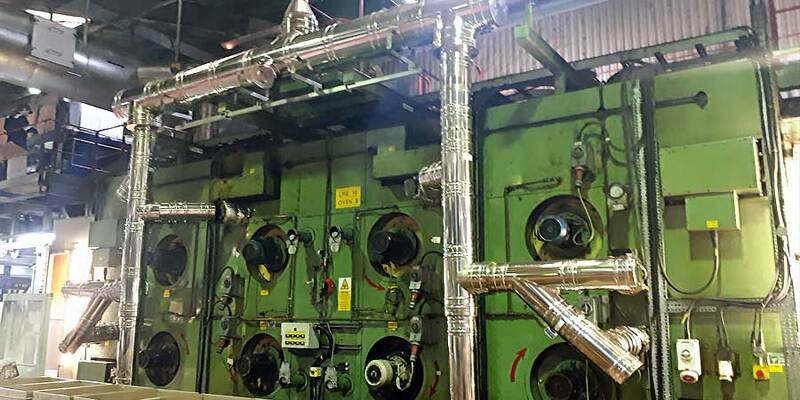 Schiedel, over the last number of years, have been installing flues to make up a manifold system between the carbon oven and the main extraction system at SGL. One of the interesting points in the installations is that the system has to be accessible in order to clean it on a regular basis, just like you would do with a residential stove.